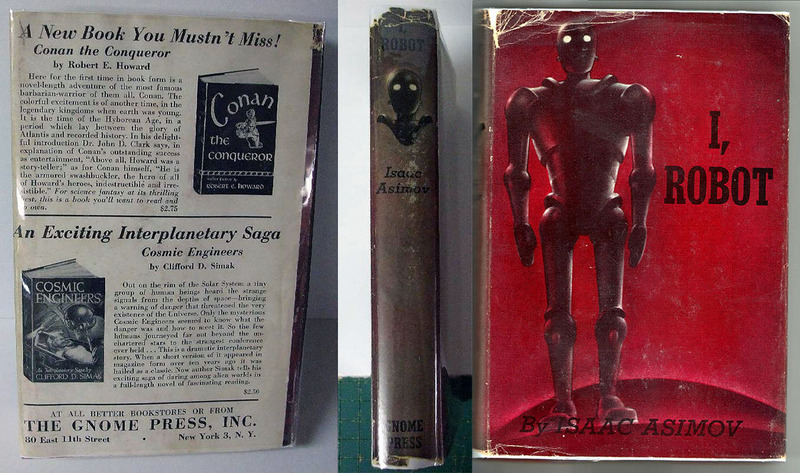 A few days ago, a copy of Asimov’s I, Robot was available on eBay. This was interesting because the start price was set very low, though it did have a reserve set. You can see the completed auction here, at least while it’s still available. Below are a couple of the images that I swiped from the auction. As we know, this is the absolute pinnacle of Gnome Press collecting. One of the pinnacles of all of SF collecting for all that. I was extremely interested in the outcome of this. Books are often posted with ‘Buy Now’ prices, but this practice gives no real indication of what a book is really worth. The online dealers don’t help much either as from what I’ve observed over the past couple of years tells me that the typical dealer prices a book something like from 50% to 75% or even more over what a no reserve auction will fetch on eBay. So, as I mentioned, the outcome of this particular auction would be a real eye-opener. It was. Reaching a final price of $380, and not reaching reserve meant that it didn’t sell of course. I was surprised. I expected it to fetch at least $500 or even more. This particular copy isn’t in great condition, sure, but it isn’t all that bad either considering the status of the title. Reflecting upon this, I suspect that having a reserve hurt the ultimate value of the auction. Anyway, thought it was worth chalking this one up for posterity and future reference. This entry was posted on September 28, 2010 at 10:18 pm and is filed under Uncategorized with tags I Robot, Isaac Asimov. You can follow any responses to this entry through the RSS 2.0 feed. You can leave a response, or trackback from your own site.